Many researchers believe that approximately 50% of fatness is genetically determined. You can’t change this! Here are some stats to help you understand this relationship. If one of your parents is obese, you are 2x more likely to be overfat. If both of your parents are obese, you are 4x more likely to be overfat. One study also makes this relationship very clear. Overfat identical twins were fed 1000 extra calories per day for 7 weeks. You would expect that each pair of twins should gain the exact same amount of weight but in fact, the weight gain ranged from 9.5 to 29.3 pounds. It’s most interesting to note that although the actual range of weight gain between twins was very high, the twins in each pair gained exactly the same amount of weight demonstrating that genetics will play a large factor in your ability to achieve a certain body type. It doesn’t mean you have to settle, you just have to understand that you may have to work harder than someone else and still may not be able to achieve a certain physique that someone else can easily achieve. When someone really fit with a super toned physique looks down on someone who is overweight and judges them they are clearly negating the influence of genetics. It is all relative and I could turn it right back on these folks. For example, I could ask them why they are not in the Olympics or playing on a national level team or winning marathons or triathlons. I could suggest they are lazy and not training correctly and not eating the right foods. But clearly that is not the case. High level professional athletes often have a higher genetic potential that most of us could never aspire to. No matter how hard I trained, I’m never winning a marathon!! So we have to do our best to be OUR best and reach our own genetic potential. You know in your heart whether you are at your best!! And we probably all could do a little better, myself included. I could be leaner and more cut but that would require me to be more disciplined with nutrition, but I like to drink wine a few times a week and indulge every once in a while. The sacrifice is not worth the reward to me and I love that I am fit enough to do whatever I want whenever I want and even though my body isn’t perfect, whatever that is, I’m very happy with it and what I can do and happy that I don’t have to be so OCD about my nutrition. So my belief is to follow the 80/20 rule and live life to the fullest! So, here’s the bottom-line message. You have a choice. You can be in shape or out of shape. You can look YOUR best or look YOUR worst. Remember, 50% is out of your control–genetics-and 50% is in your control- exercise and healthy eating. I prefer to focus on the doing…exercise, eat well, and things will take care of themselves. And I also agree that there is beauty in all sizes – just keep taking care of yourself! But the problem is that people often have very unrealistic expectations of the type of body they would like to achieve. They often refer to popular magazines to determine their ideal body. But they may not realize that many of the models are 23% underweight to begin with, have been made-up for hours, camera tricks are used, and still, once the photos are developed, the pictures are cropped, airbrushed and manipulated by computer to produce a very unrealistic, unhealthy, so-called “perfect” image. What is sad are the people who get caught in the “Geez, if I could just lose this extra 10 pounds, then I’d be happy” syndrome, yet when they do lose the weight, they’re still not satisfied. If you believe that you’ll be happy once you lose the weight, you’ll never be skinny enough to be happy. It’s a vicious cycle and it never ends unless we learn to love ourselves right now, not tomorrow or next month or next year. 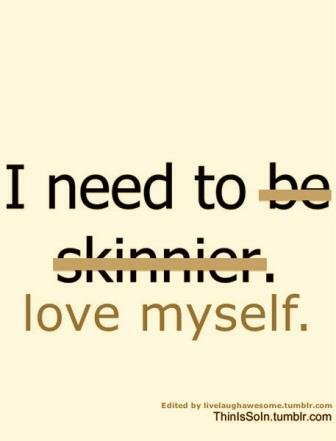 It’s ok to want to make health improvements but you can’t hate and despise yourself. Making these lifestyle changes is about believing you deserve to be healthier! You deserve to take the time out to exercise and eat well. It’s not about making the changes so you can look like someone else. If you make changes with this as you ultimate goal, you will not succeed and you’ll be miserable for life! Take our word for it. We’ve seen it happen time and time again! Body hatred and dissatisfaction are hardly reserved for only the morbidly obese. In fact, many women who clearly have very little body fat to lose are not happy with their body proportions. Ps. We are hosting the Summer Solstice Amazing Race event to benefit the Clark County Foodbank….a great opportunity to improve your speed, put purpose to your workouts and take your fitness to a whole new level! Pps. We are offering a Speed Training Clinic starting in July. Training with a group makes it a lot easier to do these faster track workouts for sure!